An engine manufacturer was receiving a high rate of warranty claims due to turbocharger failures. After extensive analysis of failed units, problems rooted in design, product selection and installation were discovered. An engineered sealing solution came to the rescue. Unlike traditional cup plugs, SFC Koenig’s are less susceptible to pressure related deformation. Working together, the OEM engine manufacturer and Tier 1 supplier reviewed failed systems and noted that malfunctions were concentrated where the actuator mounted to the turbo housing. It was discovered that cup plugs were leaking, allowing coolant to enter the assembly and accelerate corrosion. This was resulting in premature actuator failure. Cup plugs, or freeze plugs, are often selected for their low cost, and are stamped from a single piece of metal to create a cup shape. 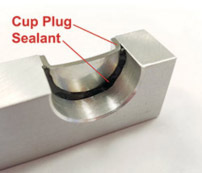 Most cup plugs use a press/ interference fit and often require sealant to achieve and maintain the seal. Cup plugs have little tolerance for port imperfections, and holes must be machined with a high level of precision. The installation of cup plugs can also be difficult. The stamped cups are susceptible to deformation due to pressure points created by installation tooling. Any deformation can reduce seal effectiveness. It is imperative that the installation system applies controlled and even pressure with proper tool alignment and precise stroke. Another installation challenge is the aspect ratio of the cup plugs, which tend to be large in diameter but low in height. Close-up of a one-piece pull-style KOENIG EXPANDER plug. The mandrel is pulled and causes the serrated sleeve to expand into the base, forming a metal-to-metal seal. The installation mandrel breaks away when the proper stroke is achieved. Engineers realized that it was relatively easy for production personnel to misalign the cup plug in the hole during assembly of the turbocharger system. Once the installation tool was applied, the plug was angled in the port, so a tight seal was not achieved. Failed units also showed evidence of damaged cup rings, which was likely caused during installation. Additionally, the turbocharger systems operated at high temperatures. High heat is always a risk when relying on chemical sealants in a mechanical system. A combination of alignment, physical damage to the cup plugs and compromised sealant integrity resulted in paths for coolant to leak through. After careful review, the engineering teams realized that the accuracy required in the cup seal installation was not feasible in the production line. While low in cost, the plugs were resulting in an extremely high total cost when warranty costs were included. Koenig Expander plugs ensure a more reliable seal than conventional fastening methods. An expander plug being installed. The full length of the serrated plug sleeve will be in contact with the base, creating a secure seal with no sealant required. An engineered expander seal was identified as the ideal solution. The metal-to-metal seal featured a unique serrated sleeve and mandrel. During installation, the mandrel was pulled into the sleeve to expand the plug into the base material. This formed a tight seal, even with a liberal hole diameter tolerance of 0.10mm. Engineers at SFC Koenig worked directly with the Tier 1 supplier to integrate its product into the design and production environment. Production costs were also reduced, as the hole required less precise machining and epoxy was eliminated (which also eliminated the risk of sealant contamination). Most importantly, the Koenig Expander plug provided a safer, more reliable and more secure seal. While the cup plug was originally selected for its low cost, the engineered Koenig Expander actually lowered total costs and provided greater seal reliability. The company reported that warranty claims caused by leaking in the turbocharger system were virtually eliminated with the new components in place.